refer to Section 2.1: Full compatibility throughout the family. manual (PM0214) available from www.st.com. Cortex-M4 core with FPU will be referred to as Cortex-M4F throughout this document. APB buses, three AHB buses and a 32-bit multi-AHB bus matrix. 16-bit timers including two PWM timers for motor control, two general-purpose 32-bit timers. � Ethernet and the camera interface available on STM32F407xx devices only. and peripheral counts for the list of peripherals available on each part number. from 64 pins to 176 pins. The set of included peripherals changes with the device chosen. 2. The SPI2 and SPI3 interfaces give the flexibility to work in an exclusive way in either the SPI mode or the I2S audio mode. greater degree of freedom during the development cycle. family remains simple as only a few pins are impacted. STM32F40x, STM32F2xxx, and STM32F10xxx families. 2. The camera interface and ethernet are available only on STM32F407xx devices. 2.2.3 outstanding computational performance and an advanced response to interrupts. metalanguage development tools, while avoiding saturation. The STM32F405xx and STM32F407xx family is compatible with all ARM tools and software. Figure 5 shows the general block diagram of the STM32F40x family. Cortex-M4F is binary compatible with Cortex-M3. processor to wait for the Flash memory at higher frequencies. execution from Flash memory at a CPU frequency up to 168 MHz. dynamically update the MPU area setting, based on the process to be executed. The MPU is optional and can be bypassed for applications that do not need it. and stored at a given memory location. RAM memory is accessed (read/write) at CPU clock speed with 0 wait states. unwanted write accesses, and is retained in Standby or VBAT mode. buffers without requiring any special code. NOR Flash and NAND Flash. � Maximum FSMC_CLK frequency for synchronous accesses is 60 MHz. interrupt lines of the CortexTM-M4F. 2.2.15 84 MHz. The maximum allowed frequency of the low-speed APB domain is 42 MHz. frequencies from 8 kHz to 192 kHz. OTG FS in Device mode (PA11/PA12) through DFU (device firmware upgrade). enabled), provided externally through VDD pins. blocks, RCs and PLL. VDDA and VSSA must be connected to VDD and VSS, respectively. Refer to Figure 21: Power supply scheme for more details. Section : Internal reset OFF). Refer to Table 2 in order to identify the packages supporting this option. threshold, VPOR/PDR or VBOR, without the need for an external reset circuit. reset (POR) / power-down reset (PDR) circuitry is disabled with the PDR_ON pin. interconnection with internal reset OFF. 1. PDR = 1.7 V for reduce temperature range; PDR = 1.8 V for all temperature range. 0 to 70 �C temperature range. A comprehensive set of power-saving mode allows to design low-power applications. BYPASS_REG low. On all other packages, the regulator is always enabled. best compromise between maximum frequency and dynamic power consumption. Refer to Table 14: General operating conditions. The LP regulator mode is configured by software when entering Stop mode. � Power-down is used in Standby mode. Figure 21: Power supply scheme and Figure 16: VCAP_1/VCAP_2 operating conditions. All packages have regulator ON feature. externally a V12 voltage source through VCAP_1 and VCAP_2 pins. should be used for this purpose, and act as power-on reset on V12 power domain. domain which is not reset by the NRST pin. connection under reset or pre-reset is required. and VCAP_2 reach V12 minimum value and until VDD reaches 1.8 V (see Figure 10). a reset must be asserted on PA0 pin. (see Table 14: General operating conditions). 1. This figure is valid both whatever the internal reset mode (onON or OFFoff). 2. PDR = 1.7 V for reduced temperature range; PDR = 1.8 V for all temperature ranges. 2.2.17 1. This figure is valid both whatever the internal reset mode (onON or offOFF). 2.2.18 2. PDR = 1.7 V for a reduced temperature range; PDR = 1.8 V for all temperature ranges. output to compensate for any natural quartz deviation. and allows automatic wakeup and periodic alarms from every 120 �s to every 36 hours. time base of 1 second from a clock at 32.768 kHz. powered either from the VDD supply when present or from the VBAT pin. tamper / time stamp events, the USB OTG FS/HS wakeup or the Ethernet wakeup). backup domain and the backup SRAM when selected. and the V12 domain is controlled by an external power. VBAT operation is activated when VDD is not present. The VBAT pin supplies the RTC, the backup registers and the backup SRAM. do not exit it from VBAT operation. more available and VBAT pin should be connected to VDD. general-purpose timers, two basic timers and two watchdog timers. All timer counters can be frozen in debug mode. inserted dead times. They can also be considered as complete general-purpose timers. feature for synchronization or event chaining. TIM1 and TIM8 support independent DMA request generation. (see Table 4 for differences). up to 16 input capture/output compare/PWMs on the largest packages. Any of these general-purpose timers can be used to generate PWM outputs. from 1 to 4 hall-effect sensors. full-featured general-purpose timers. They can also be used as simple time bases. used as a generic 16-bit time base. TIM6 and TIM7 support independent DMA request generation. management. It is hardware- or software-configurable through the option bytes. asynchronous receiver transmitters (UART4 and UART5). capability. All interfaces can be served by the DMA controller. USART1 X X X X X X 5.25 10.5 (max. USART2 X X X X X X 2.62 5.25 (max. USART3 X X X X X X 2.62 5.25 (max. UART4 X - X - X - 2.62 5.25 (max. UART5 X - X - X - 2.62 5.25 (max. USART6 X X X X X X 5.25 10.5 (max. supports basic SD Card/MMC modes. All SPIs can be served by the DMA controller. can be configured to operate with a 16-/32-bit resolution as an input or output channel. external DAC/CODEC at 256 times the sampling frequency. All I2Sx can be served by the DMA controller. performance, while using USB peripherals. 2.2.28 disabling the main PLL (PLL) used for CPU, USB and Ethernet interfaces. from 8 KHz to 192 KHz. flow with an external PLL (or Codec output). Peripheral available only on the STM32F407xx devices. receive FIFO are both 2 Kbytes. CAN is used). 256 bytes of SRAM are allocated for each CAN. the USB OTG HS in HS mode, an external PHY device connected to the ULPI is required. that is generated by a PLL connected to the HSE oscillator. 2.2.33 The camera interface is not available in STM32F405xx devices. numbers generated by an integrated analog circuit. manage internal noise, power consumption and electromagnetic emission. 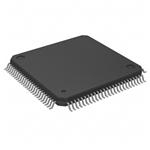 Fast I/O handling allowing maximum I/O toggling up to 84 MHz. automatic conversion is performed on a selected group of analog inputs. interrupt is generated when the converted voltage is outside the programmed thresholds. TIM2, TIM3, TIM4, TIM5, or TIM8 timer. then an external temperature sensor part should be used. the timer update outputs that are also connected to different DMA streams. switch between JTAG-DP and SW-DP. hardware is commercially available from common development tool vendors. The Embedded Trace Macrocell operates with third party debugger software tools. 1. This figure shows the package top view. 1. This figure shows the package bump view. 1. Function availability depends on the chosen device. - These I/Os must not be used as a current source (e.g. to drive an LED). 4. FT = 5 V tolerant except when in analog mode or oscillator mode (for PC14, PC15, PH0 and PH1). ON mode), then PA0 is used as an internal Reset (active low). smaller packages are given in the dedicated package column. The memory map is shown in Figure 18.